This type of lure is more generally known as a metal spoon! Typical 28g salmon Zed spinners. Shown are silver and yellow. White is also popular and effective. Yellow and even black, Zeddies are used to fish discoloured water. Many anglers add a strip of paint that is a different colour to give contrast. The Zed spinner is by far the most popular lure used by salmon anglers fishing in the rivers. It is the lure that takes the most fish. Zed spinners come in a range of weights with the most popular being 28g. The largest weight of Zed spinner available is 42g although these are not fished by many anglers. Most experienced and successful anglers fish smaller Zed spinners when the river is low and clear. Lighter 22g Zed spinners are more popular upriver where the runs and pools aren’t as deep. The 28g is the size that seems to work in most situations. Pictured here from the top are: Flamingo – also known as a Salmon Special, Kilwell Kwiksilver 28g, Phill’s Favorite, Black Tear Drop also called a Heavy Spoon, Zed Spinner 28g yellow, Zed Spinner 28g, large Zed Spinner 42g. Hooks must be kept very sharp at all times when salmon fishing. The mouth of the chinook salmon is very hard. With fish, few and far between you don’t want to be losing fish because of blunt hooks. When fishing the South Island’s big braided rivers the stony bottom tends to dull hook points fairly quickly. Always carry a stone in your gear to give them a touch-up when necessary. In practice, most anglers will change Zed spinners every so often while they are fishing and worry about replacing and sharpening hooks later. Still, other anglers prefer to carry extra treble hooks and replace their blunt hooks using a pair of split-ring pliers. It is also good practice to cut off the last 6 inches or so of line and re-tie you zed spinner on every half hour or so. Do this also after you have landed, or played and lost, a fish. The knot will be the weakest part of the line. If you don’t retie your knots every so often you will kick yourself when you lose a big salmon because you line parted from bruising at the knot. Finally always buy heaps of Zed spinners at once. It is better to buy them in bags of ten. Some days you can lose many particularly after a flood has brought down hidden obstructions. If you lose a few you don’t seem to care if you have plenty more in your bag. Zed spinners tend to get lost regularly. Though it has to be said that some blokes are more “unlucky” in this regard than others. The salmon will be down on the bottom. That is also where the snags are. If you aren’t losing the odd Zed spinner now and again you probably aren’t catching any salmon either! Don’t be afraid to try different coloured Zed spinners. I am constantly surprised that salmon will readily take colours like pink, black, mid-green, and blue. 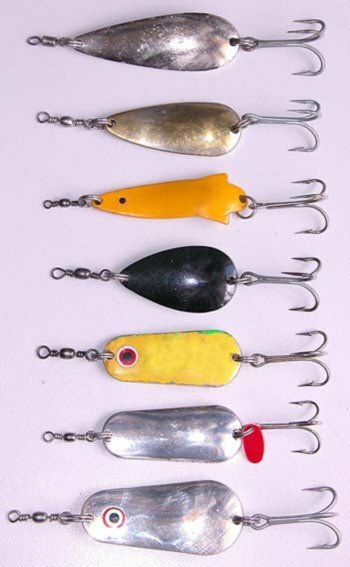 For many years I only ever fished with bright shiny silver Zed spinners usually with a red plastic tag. Even today there are many older anglers, especially, who never fish any colour other than silver. I remember fishing with the late Kevin Taylor, on his jet-boat, years ago up by Barrhill, on the Rakaia River. Kevin was a renowned trout and salmon fishing guide, who in half a century of fishing for salmon on the mighty Rakaia, had caught more salmon than I had had hot dinners! As I rigged up he looked somewhat disdainfully into my lure box containing Zeddies and Colorados of every colour and size imaginable. He insisted I tie on a silver Zeddie! It was either a 22g or a 28g. I agreed with Kevin, and quickly tied one on as he suggested. For most situations in the Rakaia River, Kevin was sure that these are the best of all to use! As anglers, we tend to stick with what has worked for us in the past. Fair enough too! Black is an unusual colour for a Zed spinner which few anglers would consider using. It is surprisingly effective and stands out when the water is a bit milky. Most importantly salmon will hit them so they certainly do work. This salmon was caught at McIntosh’s Rocks during February 2017. It was only much later that I began using yellow, and then for many years a white one with a green stripe along one edge. This later colour scheme seems to work surprisingly well even when there is a fair bit of colour in the river. Like Kevin Taylor you should stick with what you know will work, and has worked for you in the past, in similar conditions. However, I’m sure that even pink Zeddies will catch salmon! You can buy some really good painted Zed spinners nowadays. Take a look at some of the colours in the Amazing Baits range. Have you ever wondered about where all the salmon lures end up? Here’s where some of them went. All of these were found on a snag in the Rangitata River by Sam Herring and Adam Ivey. Photograph courtesy of Sam Herring. This salmon was taken at McIntosh’s close to the confluence of the Waimakariri and Kaiapoi Rivers. It had taken a “loud” looking Pink and Yellow zed spinner. I suspect the Zeddie came close to the salmon’s nose and it snapped at it. I have since witnessed many salmon taken on this particular garish coloured Zeddie. I definitely recommend you get yourself some of these. Salmon are taken on a surprisingly wide range of lure colours.